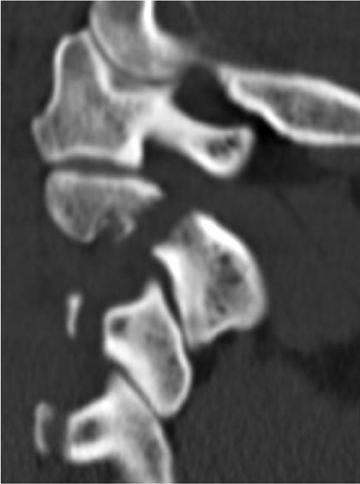 The craniocervical junction functions as one joint with complex mechanics, and because half of the rotational motion in the cervical spine occurs at the atlantoaxial junction, the joint relies disproportionately on ligamentous integrity.1 Ligamentous injury may be inferred from computed tomography (CT) and radiograph findings, or demonstrated with flexion-extension radiographs. Increasingly, however, ligamentous integrity is evaluated with magnetic resonance imaging (MRI). The radiologic examination is critical for diagnosing and treating cervical spine injuries and in preventing neurologic injury. 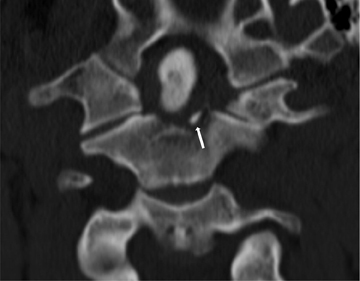 In this article, the implications of radiologic findings for spinal stability are discussed in the context of surgical treatment planning. 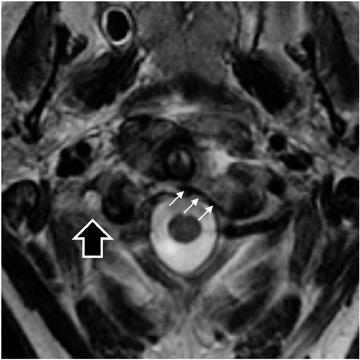 Atlantoaxial rotary subluxation in adults is rare and typically presents following MVA. The presence and extent of anterior displacement of C1 is important for treatment planning.8 However, dynamic CT for traumatic rotary subluxation of C1 on C2 is rarely indicated.9 Cervical traction in rigid cervical bracing is successful in most cases. Atlantoaxial rotary subluxation in children, an atraumatic injury, which typically occurs following upper pharyngeal infections, is a different entity. 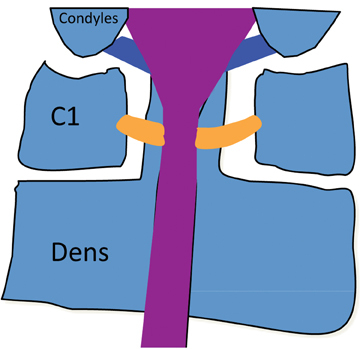 The dens fracture classification scheme, which was devised by Anderson and D’Alonzo in 1974, divides dens fractures into types I,II, and III. 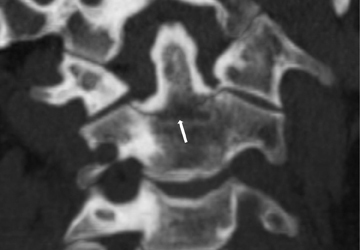 This system assists in determining prognosis and making treatment decisions.18 The type I fracture is rare, seen in only 2 of 49 cases in the original series and 2 of 340 in the largest series published to date.10,18 The proposed etiology is avulsion of the insertion of the alar ligament on the dens resulting in an oblique fracture of the dens tip as shown in Figure 6.18 Type I fractures heal without operative intervention.10,18 Six weeks of a rigid cervical collar is often utilized. In type III fractures, the fracture orientation is transverse through the superior aspect of the body (Figure 6). Type III fractures have a better outcome with nonoperative management than type II fractures, perhaps due to the large contact area at the fracture line with cancellous bone.10,11,13,18 First-line treatment remains 8 to 12 weeks of cervical hard collar or HALO immobilization. Type I: “hairline” fractures of the C2 ring with minimal C2 body displacement (Figure 7). 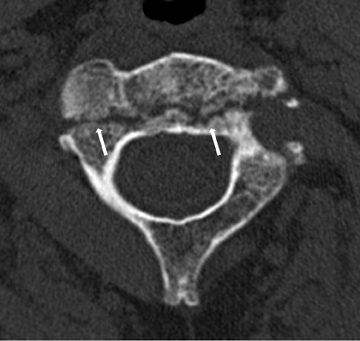 Type II: C2 fracture with displacement of the fragment anterior to the ring fracture with flexion, extension, or anterolisthesis (Figure 8). 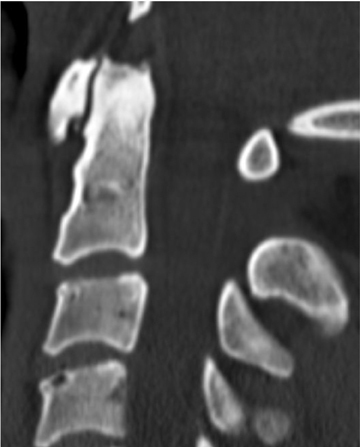 Type III: C2 fracture with displacement of the anterior fragment with the C2 body in flexion as well as locked C2-C3 facet joints (Figure9). 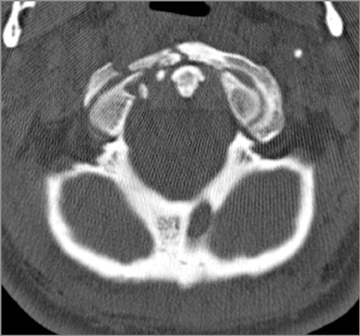 When stabilizing structures fail in the cervical region, devastating neurologic sequelae can occur, including high-level tetraplegia. Tetraplegia occurs in 1:10 spinal cord injuries, but results in 80% of direct medical costs of spinal cord injury. 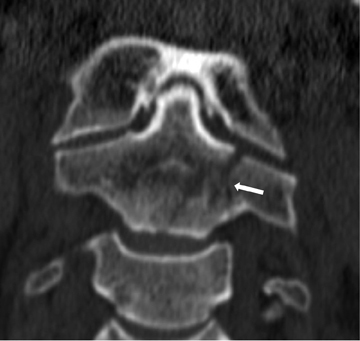 The incidence of trauma-induced spinal injury has not changed significantly over the past 3 decades, and the cervical region is the most commonly injured.33 Given the importance of the atlantoaxial joint and the frequency of cervical region injury, it is essential to recognize subtle differences in fracture patterns which convey critical information regarding spine stability. Jacobson ME, Khan SN, An HS. C1-C2 posterior fixation: Indications, technique, and results. Orthop Clin North Am. 2012;43:11-18. Koller H, Resch H, Tauber M, et al. A biomechanical rationale for C1-ring osteosynthesis as treatment for displaced Jefferson burst fractures with incompetency of the transverse atlantal ligament. Eur Spine J. 2010;19:1288-1298. Spence KF Jr, Decker S, Sell KW. 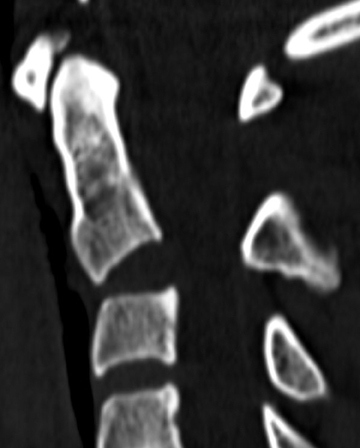 Bursting atlantal fracture associated with rupture of the transverse ligament. J Bone Joint Surg Am.1970;52:543-549. Jefferson G. Fracture of the atlas vertebra: Report of four cases and a review of those previously recorded. Br J Surg. 1919;7:407-422. Canale ST, Beaty JH eds. Campbell’s Operative Orthopaedics, 11th ed. Chapter 35: Fractures, dislocations, and fracture-dislocations of the spine. Maryland Heights, MO: Mosby; 2007:1761-1830. Dickman CA, Greene KA, Sonntag VK. Injuries involving the transverse atlantal ligament: Classification and treatment guidelines based upon experience with 39 injuries. Neurosurgery. 1996;38:44-50. Lall R, Patel NJ, Resnick DK. 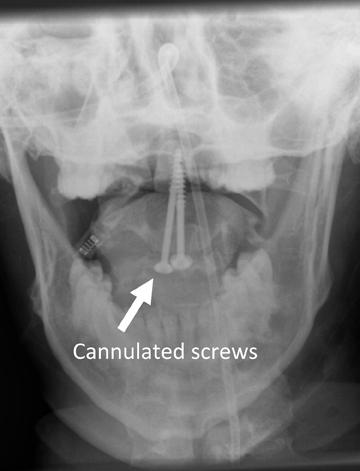 A review of complications associated with craniocervical fusion surgery. Neurosurgery. 2010;67:1396-1402; discussion 1402-1403. Fielding JW, Hawkins RJ. Atlanto-axial rotatory fixation: Fixed rotatory subluxation of the atlanto-axial joint. J Bone Joint Surg Am. 1977;59:37-44. Bono CM, Vaccaro AR, Fehlings M, et al. Measurement techniques for upper cervical spine injuries. Spine. 2007;32:593-600. Greene KA, Dickman CA, Marciano FF, et al. Acute axis fractures: Analysis of management and outcome in 340 consecutive cases. Spine.1997;22:1843-1852. Hadley MN, Browner C, Sonntag VKH. 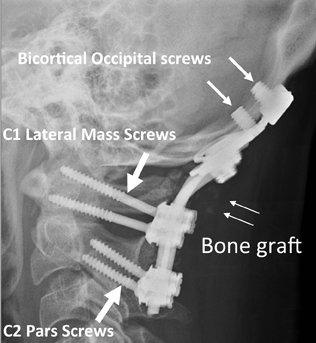 Axis fractures: A comprehensive review of management and treatment in 107 cases. Neurosurgery. 1985;17:281-290. Ryan MD, Henderson JJ. The epidemiology of fractures and fracture-dislocations of the cervical spine. Injury. 1992;21:38-40. Hadley MN, Dickman CA, Browner C, Sonntag VK. Acute axis fractures: A review of 229 cases. J Neurosurg. 1989;71:642-647. Benzel EC, Hart BL, Ball PA, et al. Fractures of the C-2 vertebral body. J. Neurosurg. 1994; 81:206-212. Fujimura Y, Nishi Y, Kobayashi K. Classification and treatment of axis body fractures. J Orthop Trauma. 1996;10:536-540. Burke JT, Harris JH. Acute injuries of the axis vertebra. Skeletal Radiol. 1989;18:335-346. Jakim I, Sweet MBE. Transverse fracture through the body of the axis. J Bone Joint Surg Br. 1988;70:728-729. Anderson LD, D’Alonzo RT. Fractures of the odontoid process of the axis. J Bone Joint Surg Am. 1974;56:1663-1674. Clark CR, White AA. Fractures of the dens. A multicenter study. J Bone Joint Surg Am. 1985;67:1340-1348. Greene KA, Dickman CA, Marciano FF, et al. 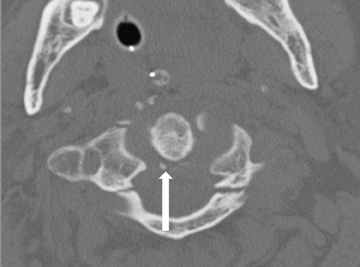 Transverse atlantal ligament disruption associated with odontoid fractures. Spine. 1994;19:2307-2314. Pryputniewicz DM, Hadley MN. Axis fractures. Neurosurgery. 2010;66:68-82. Ebraheim HA, Fow J, Xu R, Yeasting RA. The location of the pedicle and pars interarticularis in the axis. Spine. 2001;26:E34-E37. Hadley MN, Browner CM, Liu SS. 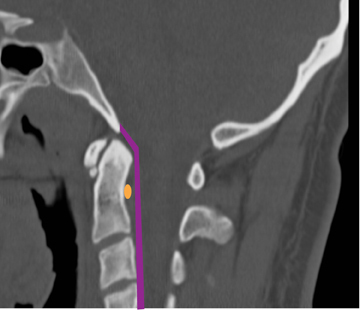 New subtype of acute odontoid fractures (type IIA). Neurosurgery. 1988;22(1 Pt 1):67-71. Schneider RC, Livingston KE, Cave AJE, et al. “Hangman’s fracture” of the cervical spine. J Neurosurgery. 1965;22:141-154. Francis WR, Fielding JW, Hawkins RJ, et al. 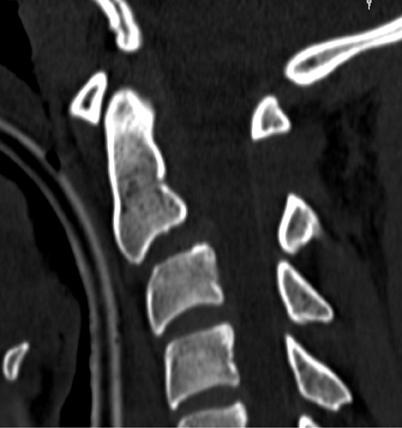 Traumatic spondylolisthesis of the axis. J Bone Joint Surg. 1981;63-B:313-318. Effendi B, Roy D, Cornish B, et al. Fractures of the ring of the axis: A classification based on the analysis of 131 cases. J Bone Joint Surg Br. 1981;63-B:319-327. Levine AM, Edwards CC. 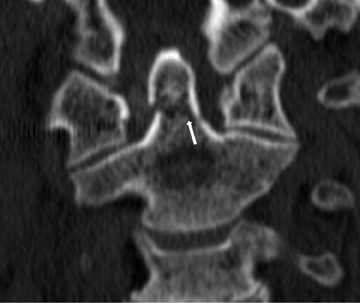 The management of traumatic spondylolisthesis of the axis. J Bone Joint Surg Am. 1985;67:217-226. Boran S, Hurson C, Gul R, et al. Functional outcome following teardrop fracture of the axis. Eur J Orthop Surg Traumatol. 2005;15:229-232. Korres DS, Zoubos AB, Kavadias, GC, et al. 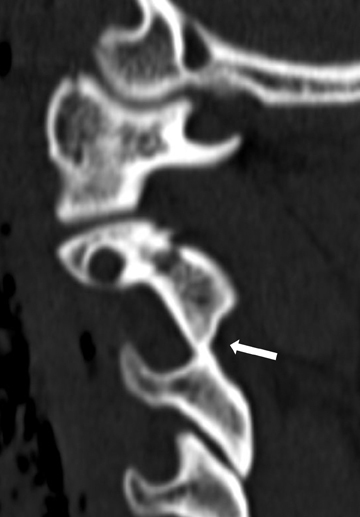 The “tear drop” (or avulsed) fracture of the anterior interior angle of the axis. Eur Spine J. 1994;3:151-154. Watanabe M, Sakai D, Yamamoto Y, et al. Clinical features of the extension teardrop fracture of the axis: Review of 13 cases. J Neurosurg Spine. 2011;14:710-714. 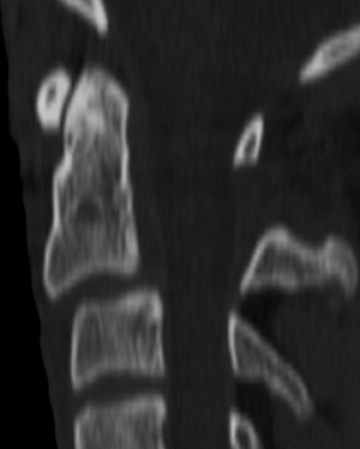 Edeiken-Monroe B, Wagner LK, Harris JH Jr. Hyperextension dislocation of the cervical spine. AJR Am J Roentgenol. 1986;146:803-808. Lee JS, Harris JH, Mueller CF. 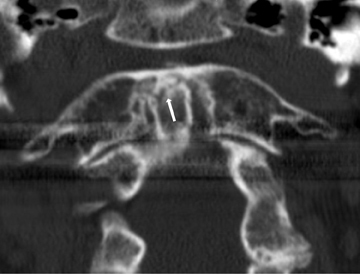 The significance of prevertebral soft tissue swelling in extension teardrop fracture of the cervical spine. Emergency Radiology. 1997;4:132-139. Bucholz RW, Heckman JD, Court-Brown CM eds. Rockwood & Green’s Fractures in Adults. 6th edition. Philadelphia, PA: Lippincott, Williams and Wilkins; 2006. 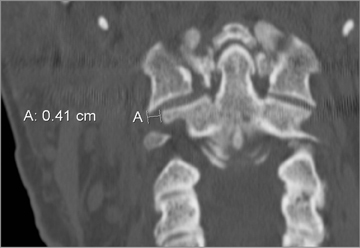 Characterizing traumatic spinal injury at the atlantoaxial junction. Appl Radiol. Dr. Strother and Dr. Day are in the Department of Radiology and Radiological Sciences, and Dr. McGirt is in the Department of Neurological Surgery at Vanderbilt Medical Center, Nashville, TN.